If you love nature, you should not miss out Penang Botanical Garden. You can find out the basic about the Botanical Garden here. However I am going to share with you some of my feeling to this place. There are many monkeys in this garden, make sure you are not carrying any foods, ice-cream or drink in your hand, the monkey will just come in crowd. Taking photo about monkey is one of the common scene you will find in this garden, unfortunately I am not in the game. You can see many people is photography about this 2 happily monkey. You can only see the crowd but the monkey are too small in the photo. 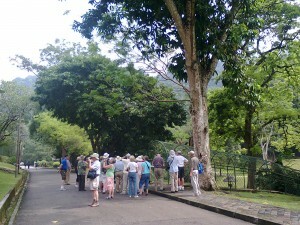 What else you could enjoy in Penang Botanical Garden? Botanical Garden is always more than monkeys you can see. 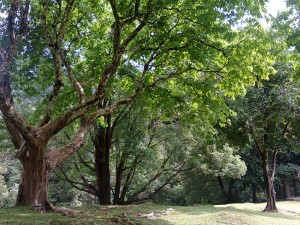 The botanical garden is not like a garden with flower but trees. Many tree species, waterfall, orchids are all you can see in the garden. Looking for birds, if you are patient enough, you can even see some hawks flying at Penang Hill direction. Taking a garden car ride is not a bad idea as the guide will provide a briefing about the Penang Botanical Garden, it always worth for money. Tree is always my attraction. I love tree. The dark colour stem and green leave bring the garden into live. The sunlight is making the terrace profile a 3D feeling. I wish I could have my camera and lens appears in the right timing. You should be able to get a good opportunity to take a good photo in Penang Botanical Garden. Next time while you are in the Penang Botanical garden, put on your jogging shoes and it was fun having a jogging in the garden. Or enjoy trekking in one of the trekking trail, toward Gate 47.